Your home is your largest investment and preserving your comfort, lowering your cooling costs and improving your home’s security and safety is critically important. As an Eastman LLumar SelectPro and Huper Optik Dealer we take our responsibility seriously. We know that our customers demand and deserve the best films and the best possible installation. There are never compromises on customer satisfaction! Advanced Film Solutions film portfolio includes films that have low or no added reflectivity. Our Huper Optik and Vista ceramic films are the state of the art. These non reflective films are perfect for deed restricted communities and all HOA rules. Architecturally and aesthetically pleasing, they are the right choice for our customers. Eastman window films offer long-term value and a superior return on investment. Our film quality goes well beyond the numbers. Eastman LLumar SelectPro Vista Window Films are built to last. Incredibly clear adhesives, durable hardcoats that protect our installations from scratches that will extend the useful life of your investment. Thicker clear and tinted security films provide home security and safety from burglars while lowering cooling costs and filtering out 99.9% of the UV. 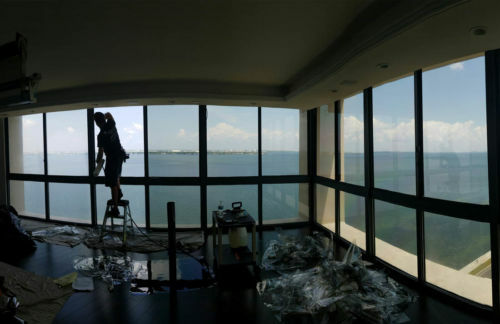 Eastman Vista, FormulaOne, Llumar, Huper Optik Window Films Installations. We travel to Hillsborough, Pinellas, Pasco, Orange, Sarasota and Manatee County Tampa – Orlando and beyond! Call 877-575-3456 Today For More Info about Residential Home Window Tinting!